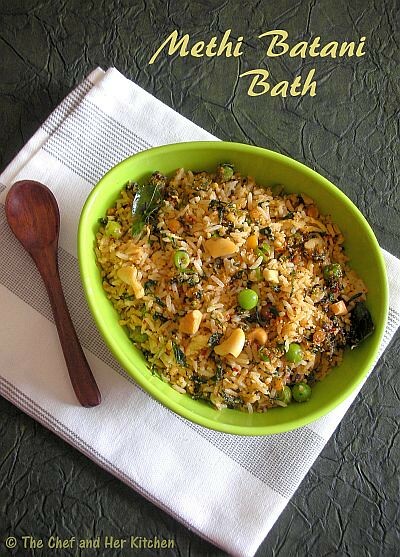 Karnataka has lot of options for rice varieties and few recipes are even ideal for breakfast and also on festival occasions.If you want to have a look at few of the various rice varieties,check out this page which I have posted earlier.I generally make methi bath in a simpler manner similar to vangi bath and I have adapted few steps from a cookery show which made it even more delicious.This is ideal for lunch box and as it does not have onion and garlic it is even ideal for festival days.Try out this delicious combination methi and peas with coconut which makes the rice very tasty. Wash and soak basmati rice for 10 mins.Add 1/4 cup coconut milk,ghee,oil,salt and 1 3/4 th cups of water and cook until done over stove top or in pressure cooker or rice cooker.If you are cooking in pressure cooker,pressure cook for 1 whistle and reduce flame and cook for 8-10 mins.Spread the rice on a big plate or vessel. Dry roast urad dal and chana dal until light red in color and drop them in the mixer.Dry roast coriander seeds,laung,moggu,cinnamon,red chillies and add to the urad dal mixture.Dry roast curry leaves until dry and also add hing to it at the end and drop in the mixer.Now grind this to a fine masala powder. Heat 2 tbsp oil and 3 tbsp ghee in a big kadai and crackle mustard seeds and add urad dal,chana dal and chopped cashew nuts and fry well until light golden in color. Add curry leaves,chopped methi leaves and green peas and fry until the leaves wilt and peas are fried and cooked. Add 3-4 tbsp masala powder to it and fry well. Add grated coconut and salt to it and mix well.Remember to add less salt as we already added salt to rice while cooking.Switch off the flame and pour this mixture over the rice and mix well. Add lemon juice and mix.Now check for the taste of rice and add extra masala powder or salt if needed according to your taste buds. Serve it hot/warm/cold along with onion raitha and chips/papad. The masala powder might yield in more quantity.You can save this in air-tight container for next usage or you can use this to make yummy dry vegetable curries like brinjal and potato. 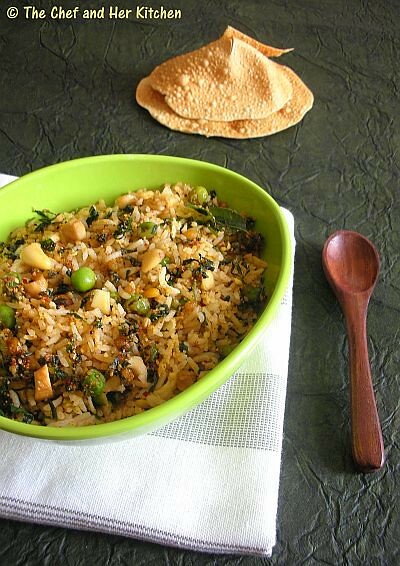 As this is no onion-no garlic rice one can prepare this on festival days as well. Nice and delicious rice !! love to carry in my lunchbox !! very healthy and delicious...love the presentation too! Love this one pot meal..and the presentation is wonderful. 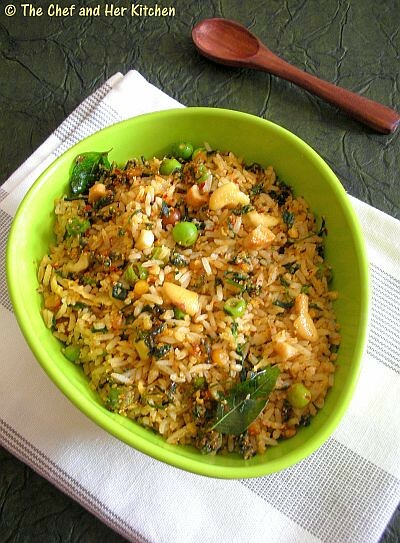 Wow wonderful rice .. love it for lunch..
Never thought of adding green peas with methi..cool recipe!! Methi Peas Bath looks very inviting. I have all the ingredients rite now. I can't resist myself to try this out for lunch. Thanks for sharing dear. Yumm and flaavorful recipe Dear Luv it. Very nice. 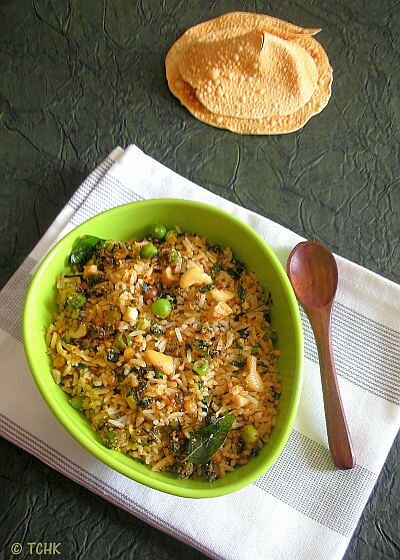 Loved the use of coconut n coconut milk in it as my version is more a masala methi matar rice . Would love to try this different spicing for methi rice. 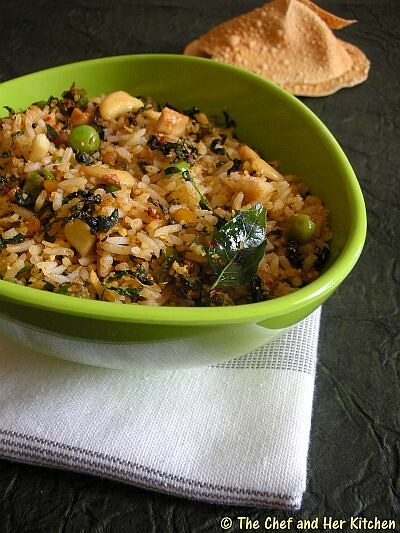 healthy rice...never tried with methi...gud one! Lovely recipe...and such flavorful too..
Super flavourful one pot meal..looks fantastic. Long time since i have had this one. Thanks for reminding me. Bookmarked. I havent tried this combo... will try soon. lovely presentation..
Yum,looks so good.I love methi in my pulao too! Nice combo..... rice looks absolutely yummy. prathiba loved the pics.....and a stunning recipe as well. I have heard of only one bath and its the Bisi bele bath. This one looks tempting Pratibha. Ideal for pot luck. It should make a meal more satisfying n hearty. Nice and flavorful rice,bookmarked.First time here following you dear.Please do drop at my space time permits. wow.. delicious looking rice.. enjoyed viewing your posts... fabulous collection of recipes..glad to follow you.. do visit my blog sometime.. Very delicious & flavorful rice, looks fantastic!